A top quality solid paste for applying to floating fly lines to help them float and preserve their finish. Simply apply with the felt pad that comes in the tub. 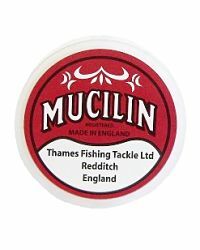 The red version of Mucilin is suitable for use on both silk and modern plastic fly lines. A top quality solid paste for applying to floating fly lines to help them float and preserve their finish. Simply apply with the felt pad that comes in the tub. The red version of Mucilin is suitable for use on both silk and modern plastic fly lines. Does what it says it does excellent product. Great traditional product. If using a furled leader (especially cotton), you MUST treat it with this stuff prior to fishing. Also great to dress floating fly lines with.